Viennese humor can easily be lost on non-German speakers, but in the case of this not-so-classy classified, the intentions of its author weren’t quite clear. Online audiences were divided over a recent willhaben.at ad for a used kitchen, which touted its good condition in a curious way. Putting the beige kitchen on the resale market for €200, the ad’s author simply stated that it is “in good condition, because my old lady can’t cook.” To fully appreciate it, here’s the ad’s main selling point in German: “Guter Zustand, da meine Oide net kochen kann.” Whether you think the willhaben post is funny or chauvinist, it seems to have done its job – as well as trigger outrage from unamused netizens. There’s no word on what the poster’s definitely-better half thought about the ad. Viktor Orbán isn’t one to horse around: The Hungarian prime minister apparently takes his political alliances as seriously as he does crackdowns on the press, as a recent gift to the Alpine republic has shown. Orbán seems to appreciate Austria’s valiant effort to improve European security with a 11-horse-strong mounted police unit. But Minister of the Interior Herbert Kickl’s party hasn’t always been so welcoming of nonlocal animals. Recently, local Freedom Party politician Gottfried Waldhäusl caused a stir with his warning of dogs with a “migration background” taking up precious space in animal shelters. 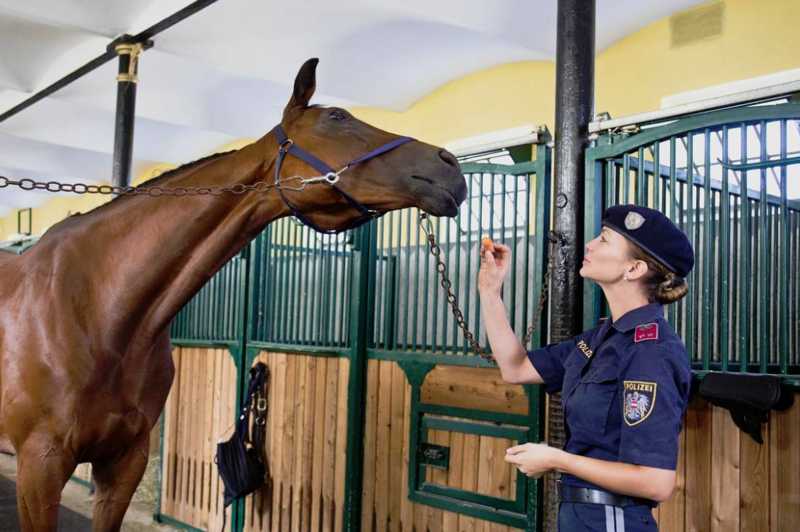 (see “Weird News,” MET Jul/Aug 2018) Now closer to establishing a mounted police force for Vienna, a commission has been established to select the remaining horses from stud farms in Hungary, Germany and Austria. And if you’re a police officer interested in joining the cause, it’s not too late – recruitment is still open! DOES THE VIENNESE COMMUTE STINK? Vienna is known for its excellent commuting experience, but a publicity stunt by the Wiener Linien, which operates the city’s public transportation system, briefly made people think otherwise! In the heat of summer, the U6 subway line was chosen by City Councilor Ulli Sima and Wiener Linien boss Alexandra Reinagl for an inspired public service targeting perspiring commuters. Many commuters already know that the U6 tends to heat up faster in the hot summer months as it mostly runs above ground; the fact that about half of all train carriages aren’t yet equipped with air conditioning units doesn’t help. So a little perspiration is par for the course when temperatures top 30 degrees – but any relief is sure to be appreciated, which is why this particular giveaway promoting new cooling measures was well-received. Over 14,000 free deodorants were “ripped out of the hands” of Wiener Linien workers on a single day in mid-July, according to spokesman David Amann. It was so successful, in fact, that international media outlets such as the Washington Post , National Public Radio, the BBC and many others didn’t turn up their noses at reporting about this viral stunt. The German FAZ even asked: “Do these commuters stink?” Now, with its anti- odor offensive in full swing, the Wiener Linien has identified the next culprit: from September on, food will no longer be allowed on the U6, and a general ban on food on the subway will follow next January!